The month of February features both Lincoln’s Birthday and Washington’s Birthday. Nowadays they’re usually celebrated in most states under the generic single day of “Presidents’ Day.” Officially, “Washington’s Birthday” is still the federal holiday for the third Monday in February. However, various states have opted to use “Presidents’ Day.” Snopes explains its origins, but mostly, it seems to be a way for states to consolidate holidays (and time off). Cartoons don’t seem to make much note of Presidents’ Day (or the two separate presidents’ holidays). However, there are instances of the holiday and the two famous presidents involved being used. The early 70s Rankin-Bass special “Here Comes Peter Cottontail” is an Easter special, but involves time-travel to various holidays. Toward the end of the special, we see Peter grow increasingly desperate as he runs low on holidays. 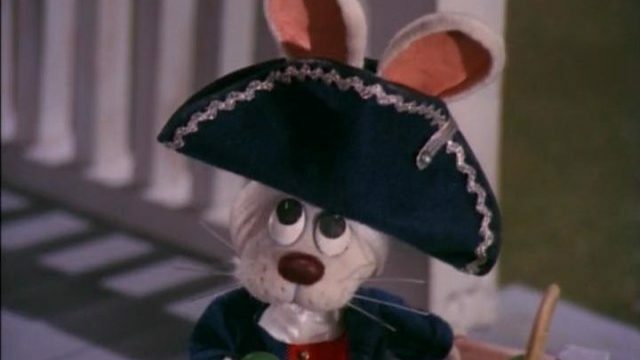 Thus, he tries to give away his eggs on Washington’s Birthday, dressed as a bunny version of Washington. “The Flintstones’ New Neighbors” is a 1980 primetime special where the Flintstones and Rubbles gain new neighbors, the Frankenstones. They’re a family of “Munsters”-like monsters headed by patriarch Frank Frankenstone. The plot sees Fred loathe his new neighbors as “weirdos.” However, by the end of the special (and after the Frankenstones help save Pebbles’ life), he learns to like Frank. The special’s climax revolves around a picnic held on “Washingstone’s Birthday,” a prehistoric holiday Fred has the day off of work for. The fourth season episode “I Love Lisa” sees Springfield Elementary put on a hilarious Presidents’ Day play. The play starts off with a number about the “mediocre presidents.” It then segues to a sketch about Lincoln’s assassination; Bart tries to turn it into a “Terminator” parody before being hauled off the stage. The final scenes feature Ralph playing George Washington and Lisa playing Martha. Marge: Well, leave it to good ol’ Mary Bailey to finally step in and do something about that hideous genetic mutation. Homer: (snort) Mary Bailey. Well, if I was governor, I’d sure find better things to do with my time. Homer: Like getting Washington’s Birthday and Lincoln’s Birthday back as separate paid holidays. “President’s Day” (blows a raspberry) What a rip-off! Syndicated and PBS educational series “Liberty’s Kids” featured General Washington in various episodes. “Peabody’s Improbable History” from “Rocky and Bullwinkle” featured General Washington in two episodes. The first was about Paul Revere’s ride, where Peabody teaches Washington that “famous old hog-call cry” as a way of both summoning Revere and rallying enough troops. The second episode was about British General Cornwallis’ surrender to General Washington at the Battle of Yorktown. However, it mainly focused on Cornwallis’ side of things; he needed Peabody and Sherman’s help in finding a sword so he could formally surrender. Educational cartoon “Histeria!” often featured Washington, who was a parody of comedian Bob Hope’s voice/mannerisms. An early storyline saw a villain bring to life the statue of Abraham Linkidd (a goat) at the Linkidd Memorial. From “Captain Carrot and His Amazing Zoo Crew” #3 (May 1982). Art by Scott Shaw!. For some reason, a semi-common cartoon cliché is someone (usually a villain) bringing the statue of Abraham Lincoln at the Lincoln Memorial to life. Besides the Captain Carrot story mentioned above, below are some other examples. 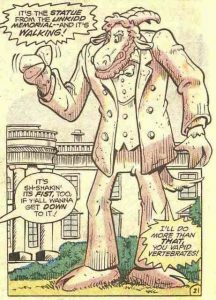 The episode “Ambulatory Abe” features the Brain’s latest plan: to sneak into the Lincoln Memorial and retrofit the statue into a mobile, voice-controlled, marionette-like puppet. Brain then claimed “Abe” had come back to life, and was ready to resume being the president. Of course, Brain’s plan was spoiled in the most improbable manner (as usual). An episode of “South Park” saw the villain of the episode (magician David Blaine) bring to life the Lincoln Memorial statue. The episode’s heroes (Jesus, Moses, and other religious icons as a “Super Friends”-like team) band together to stop Blaine/the Lincoln statue. Their solution? A giant statue of Lincoln’s assassin, John Wilkes Booth. “Captain America” #222 (June 1978) sees villains bring the Lincoln Memorial statue to life to fight Cap and his mighty shield.